In a turbulent era of 1960s Cold War confrontations, moon race headlines, and war in southeast Asia, eight military and civilian test pilots flew the radical X-15 rocket plane out of the atmosphere and into the record books, earning astronaut status. Until Tuesday, three of those early astronaut test pilots never received official recognition of their lofty membership as astronauts because only the military had astronaut wings to confer on their pilots at that time. Civilian NASA pilots had no such badge. That inequity was rectified today when retired NASA pilot Bill Dana, and family members representing deceased pilots John B. McKay and Joseph A. Walker, received civilian astronaut wings acknowledging their flights above 264,000 feet altitude -- 50 miles high. The men were honored in a quiet ceremony at NASA's Dryden Flight Research Center on Edwards Air Force Base in California, site of their achievements. Bill Dana was philosophical about it: NASA pilots didn't wear wings anyway, and the concept of winning special wings was probably more crucial to a military pilot's career ladder, he explained. Dana's first of two flights into space took him 58.13 miles above the Mojave Desert on Nov. 1, 1966 on a mission to collect micrometeorite samples, while also learning about issues of sky brightness at that height. Joe Walker's third X-15 foray into space claimed the unofficial world altitude record of 354,200 feet, or 67.08 miles, on Aug. 22, 1963. 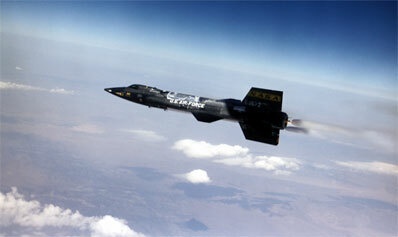 Walker's unofficial record also marked the highest altitude to which the X-15 was ever flown. John McKay attained 295,600 feet altitude, or 55.98 miles, on Sept. 28, 1965 during during a flight that investigated several research experiments. The X-15 program used three piloted hypersonic rocket planes to fly as high as 67 miles and as fast as nearly seven times the speed of sound. Volumes of test data gleaned from 199 X-15 missions from 1959 through 1968 helped shape the successful Mercury, Gemini, Apollo, and Space Shuttle human spaceflight programs. Two retired X-15s are displayed at the National Air and Space Museum, Washington, D.C., and the Air Force Museum, Dayton, Ohio.